Madrid - Spain coach Julen Lopetegui believes an enticing clash with European champions Portugal, led by World Player of the Year Cristiano Ronaldo, to start their World Cup campaign leaves the 2010 champions with little room for error in Russia. The Iberian neighbours will be favourites to progress from Group B after also being paired with Morocco and Iran in Friday's draw in Moscow, but they face each other first up in Sochi on June 15. Real Madrid's Ronaldo is just one of a number of Portugal's top players who ply their trade in Spain, but Lopetegui was keener to point to the overall qualities Portugal showed in claiming their first major trophy at Euro 2016 just 18 months ago. "Straight away it isn't the time to talk about individuals," Lopetegui told Spanish TV station Cuatro. "Portugal have won an important title and, moreover, very recently. They are the champions of Europe, they have fantastic players and we are talking about the highest level." Indeed, Portugal survived without an injured Ronaldo for the vast majority of the Euro 2016 final to shock hosts France thanks to an extra-time goal from Eder. However, Portugal have failed to beat Spain in seven previous meetings at major tournaments, including as the Spanish went on to lift their only World Cup in South Africa in 2010. 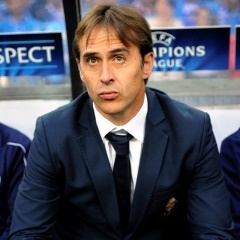 "What matters to us is to play a great game when the time comes and to be capable of beating them," added Lopetegui. "The rest is history." Lopetegui was at least happy with Spain's draw in terms of logistics with their expected base in Krasnodar just a half an hour flight away from Sochi before facing Iran in Kazan and Morocco in Kaliningrad. "Until it is official I can't say anything, but it is more than probable the base will be (Krasnodar)," he added. "Knowing the distances there could be in Russia, it is quite balanced." Iran's Portuguese coach Carlos Queiroz, who also had a brief spell in charge at Real Madrid, was more enthusiastic as he claimed he couldn't have wished for a better draw. "Personally I am very happy because it is a group with two teams from two very special places for me," said Queiroz. "It will be a very tough competition for us, it would have been no matter what group we were in, but when you are with Spain, a World Cup winner, and Portugal, European champions, it couldn't be better for me."